Unless you're regularly taking advantage of recent deals for cheap flights to European cities, there's a good chance you're only forced to dig your passport out of your junk drawer for an international flight every other year or so. But because the Transportation Security Agency (TSA) cares little about earning the love of everyday Americans, passports may be a necessity for both international and domestic flights starting next year. As of this month, nearly two dozen states issue IDs and driver licenses that don't meet federal security requirements, according to the latest info from the Department of Homeland Security. This means you could soon be forced to present additional identification such as a passport or Enhanced Driver's License at airport security because the driver's license you've been using for years now may no longer suffice. The potential travel headache all comes down to a groan-worthy piece of legislation that's been lurking in the shadows since 2005, the REAL ID Act. Passed in the years after 9/11, the act "prohibits Federal agencies from accepting for certain purposes driver’s licenses and identification cards from states not meeting the Act’s minimum standards." 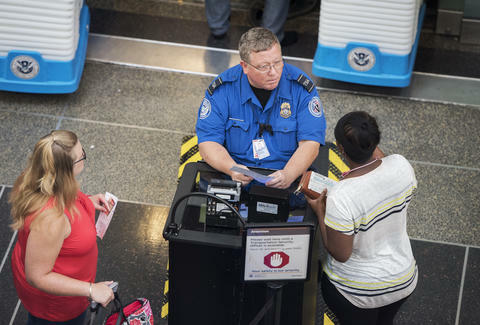 In grumpy airline passenger parlance, the TSA could hypothetically turn you away at airport security if you have a driver's license or ID from a state that has yet to meet the law's new security requirements. This could happen even if you're flying from St. Louis to Tulsa, or Anchorage to Portland. 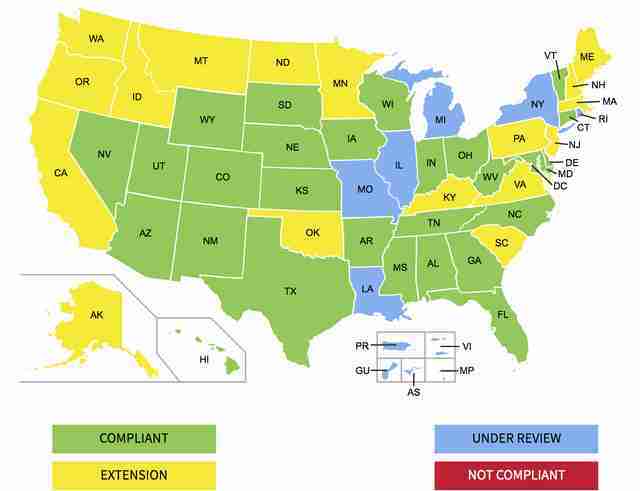 As you can see on a map from the Department of Homeland Security (shown above), 27 states and the District of Columbia (in green) currently meet the federal requirements, so you're in the clear if that's where your ID was issued. Meanwhile, 17 other states (in yellow) were granted an extension until October 10, 2018, ensuring their existing IDs can be used at airport security until then. However, six states (in blue) -- Illinois, Louisiana, Michigan, Missouri, New York, and Rhode Island -- have yet to receive an extension as of this writing and their IDs may no longer be accepted at airport security when the law's current grace period expires on January 22, 2018. (Yes, it's this complicated, unfortunately.) As of now, you can still use an ID that's not REAL ID Act compliant to board domestic flights in every state, but that could certainly change come next year -- and as quickly as January. "Extensions are granted on an ongoing basis at the discretion of the secretary of homeland security," a DHS spokesperson told Thrillist in an email. "If a non compliant state does not have an active extension at the time of air travel enforcement in January, they will need alternative identification to fly." In total, 23 states don’t meet the federal requirements and have either received an extension or have requested an extension beyond the January 22, 2018 cut-off date. At this point, it’s safe to assume that every state will receive an extension through October 10, 2018, and potentially additional extensions that will allow travelers to continue using their IDs at airport security with no problems. Hopefully, every state will make ID cards that meet the law’s requirements by October 1, 2020, because that’s when the TSA will no longer accept anything other than a REAL ID-compliant ID or driver’s license. It's worth noting that five states -- Michigan, Minnesota, New York, Vermont, and Washington -- currently offer Enhanced Driver's Licenses, which the TSA will accept at airport security checkpoints, according to DHS. Getting an EDL can sometimes cost more than a regular driver's license, though. But at least it's better than having to whip our your passport at airport security every time you fly. According to recent local reports, state governments are scrambling to update the IDs they issue in over the next few months, but are encountering some financial setbacks along the way. Such is the life of your state government, which is often hampered by red tape. Other forms of ID will be permissible if your state misses the January 2018 deadline, such as a permanent resident card/green card or a military ID. The moral of the headache-inducing story is to apply for a passport if you don't already have one or renew your passport if it's currently expired -- and there's clearly ample reason to do it quickly.